The 1905 version of the Cardinals went back downhill. Jack Taylor continues his streak of complete games but is accused of throwing games and is found innocent. Dave Brain hit three triples in one game (May 29) against the Pirates and then six days later is traded to Pittsburgh. The team has three managers during the season as Kid Nichols (5-9) starts the year and is replaced by Jimmy Burke (34-56) to be followed by co-owner of the team Stanley Robinson (19-31). The first three years of Stanley Robison’s ownership proved miserable for him and for the Cardinals. Managed by John McCloskey, whose previous experience in that capacity included two twelfth-place finishes with the Louisville Colonels in the late nineteenth century, the Cardinals dropped from .347 to .340, ending the season of 1908 at .318. In an endeavor to reverse that trend, the younger Robison brother went looking for new leadership. Outbidding every club in the league, he snagged the Giants’ star catcher, fiery Roger Bresnahan, the Duke of Tralee, to serve as his club’s player/manager. The offense is not very good as Homer Smoot leads the team with a .311 average along with 58 runs batted in and 21 doubles and 16 triples. Spike Shannon (outfielder) leads the team with 27 stolen bases. The pitching slips from the year before and Jack Taylor is 15-21 and 3.44 ERA. Jake Thielman is 15-16 and a 3.50 ERA. The team completes the season by losing a doubleheader to the Cubs and finishes 47.5 games out of first place with a 58-96 record. They score 535 runs and allow 734 runs to the opposition. The day after the World Series, the Cardinals and Browns play a game called “City Series” for bragging right. Harry Howell wins both games for the Browns (7-6, 3-0) while Jack Taylor loses both games while having the same plate umpire for both games. There certainly “bragging rights” for the Browns fans. August 4, 1905: The Detroit Tigers purchased Jack Warner from the St. Louis Cardinals for $1,500. July 19, 1905: Toledo (American Association) purchased Josh Clarke from the St. Louis Cardinals. July 16, 1905: Toledo (American Association) purchased Dave Zearfoss from the St. Louis Cardinals. July 4, 1905: The St. Louis Cardinals traded Dave Brain to the Pittsburgh Pirates for George McBride. 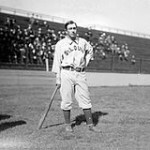 January 25, 1905: The St. Louis Cardinals purchased Win Kellum from the Cincinnati Reds.